I’ve just had a really hectic weekend, after a long week at work I headed 85 miles from home to Norwich Ski Centre in Norfolk for the British Artificial Snowboard Championships, nick-named the mini-Brits. This was the first of this year’s series of UK based snowboarding & skiing competitions and was ranked as a TTR 1 star event, the upcoming indoor snow comps are all ranked as 2 star events, and comprised of boardercross, big air and slopestyle over the course of the weekend. It was great to see everyone together again as most of us don’t get the chance to catch up over the Summer and I hadn’t seen most of the riders since the British Championships in Laax in April. 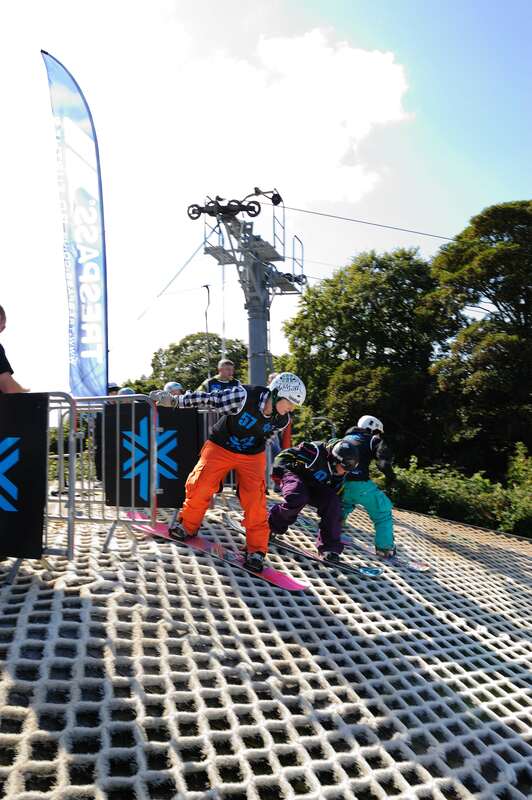 The weekend kicked off on a scorching Saturday with the boardercross, which took place on the main Dendix slope, and we each took 2 timed runs. We then moved through to some races with 2-3 people battling it out at the same time. Don’t be fooled, Dendix is not easy stuff to ride and its diamond shaped sturcture means falls can get nasty, luckily though the slams I had in warm-up coincided nicely with where I’d placed my padding and I survived in 1 piece. I finished the morning session in 2nd place in the Masters (over 30) age group. The afternoon was spent sessioning the kicker for the (big) air competition. Unfortunately the slope was running quite slowly and so if you didn’t land in quite the right spot then your board stopped and you kept going….cue whiplash for me! I’d decided to try and step things up, with only 3 in my group I figured I might as well try the spins I’d been working on in practice. It didn’t work out though and although I did a really nice BS180 Method I sat down on my landing, my second run was even worse and I managed a big FS90 to slam. The way I see it though if I’d landed the tricks I’d have been in with a chance, both girls in my group are trying 540s so I had no option but to step things up. Sunday was slopestyle day and it was a bit cooler, unfortunately the slope was still running really slowly, so much so that the judges had the toys swapped around as people weren’t able to get enough speed to hit the higher scoring line the way it was originally set up. After a few practice runs I managed to work out the line I needed to keep my speed and my first comp run was a smooth and clean frontside nose press, followed by a nose press and then a 50:50 to boardslide, switch out over the up-down shark’s fin. It all went wrong on my second run though, I did a nice tail press to switch over the first box, but slipped out on my switch frontside on the next box ending nicely in a perfect faceplant. Hopping up the slope to try and get enough speed for the shark’s fin, I tried but failed and made it half way up the up box before having to jump off. I just missed out on a place in the final by coming 5th overall but my first run was enough to get me 2nd in the Masters. So I finished the weekend with 2 silvers and a bronze, not bad going considering the sticky conditions. The big air and slopestyle will both get me started in this season’s TTR ranking and hopefully my luck will hold for this Saturday when I head to Milton Keynes SNO!zone for the British Indoor Big Air championships.